Want to watch new shows on CBS live? Want to know how to watch live The Big Bang Theory, watch the new season of How I met your mother and many more with CBS live streaming? All the answers are here. The new season of The Big Bang Theory started on CBS last week, and the US viewers can now watch all the shows live or their replays on the CBS channel. But if you are based outside of the US, you cannot access all the online content on the CBS website and cannot watch the shows live, or even their replays. 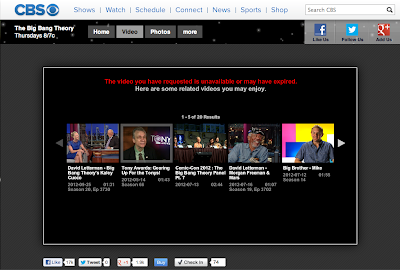 Here’s the message you’ll usually get: “The video you have requested is unavailable or may have expired”.Which means that CBS does not have the rights to distribute this video online in your country, because it has probably already sold the distribution rights to the TV networks in your country. How to watch The Big Bang Theory and other CBS shows live if you are based outside of the US? With Le VPN you can connect to the US server in less than a minute, change your IP address for the one in the US and watch CBS live from France, Germany, UK, Russia or anywhere else in the world where you are currently based. Le VPN is an acronym for “virtual private network”. It is a secured virtual tunnel that sends all your online traffic in a highly encrypted form through one of the servers that you choose to connect to. During this process, the IP address of your computer/device changes to the IP address of the server that you connect to, masking your real IP and making you virtually reside in the country of your choice. Le VPN currently has VPN servers in 12 countries, including the US, UK, France and Germany. To learn more about how Le VPN works, please visit www.le-vpn.com.